IC Arizona: Schweikert for Congress: Where do you stand on SB1070 - with Obama or half the American public? Schweikert for Congress: Where do you stand on SB1070 - with Obama or half the American public? The Obama Administration is dividing the country with its inability to enforce immigration law. -- But you and I know better. Gallop reported last week that more than half the American public supports Arizona and its measures to protect itself in the absence of federal leadership. And the authors of Arizona’s SB1070 law have endorsed David Schweikert. Stand with Sen. Russell Pearce and Rep. John Kavanagh TODAY and support David Schweikert with your most generous contribution RIGHT NOW. Help David Schweikert defend Arizona. David knows what it is going to take to fight this fight in Washington. It is time for the Obama Administration to stop grandstanding and start owning up to its responsibility to enforce federal law and secure our borders. Harry Mitchell is circling the wagons and he knows he’s in trouble. The attacks are coming any day now. --Please support the Schweikert campaign today. David Schweikert will need absolutely every single dollar to combat the deep pockets of Harry Mitchell and Nancy Pelosi – whether it’s $15, $25, $50, or even $100 TODAY - - please give; you’ll be glad you did. Unlike Harry Mitchell, David’s record is clear. David has always stood strong against illegal immigration and called for strong enforcement and border security first. It is critical that we stand up against the Obama Administration’s plan to stop SB1070. 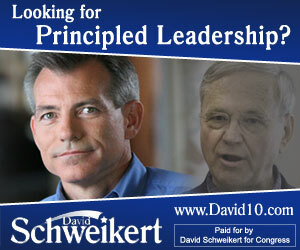 That is why David Schweikert needs your help TODAY. David is the true conservative with a proven record we know and trust. Please support the campaign RIGHT NOW and keep our conservative message loud and strong! P.S. The need for strong conservative leadership in Washington has never been more critical, and the time for action is NOW. Please make your most generous contribution to the Schweikert campaign. David needs your help TODAY to retire Harry Mitchell.